Dr. Nayla Tabbara is the director of the Adyan Institute and the vice chair of Adyan Foundation and, previously served as director of its Cross-Cultural Studies Department. She holds a doctorate in religious studies from the École Pratique des Hautes Études (Sorbonne, Paris) and Saint Joseph University (Beirut, Lebanon) and is a university professor of comparative religions and Islamic studies. She has published in the fields of Islamic theology and other religions ; education on interreligious and intercultural diversity ; and Qur’anic exegesis and Sufism. In addition, she works on curricula development (formal and non-formal) for multifaith education and intercultural citizenship. Her publications include Divine Hospitality : Christian and Muslim Theologies of the Other (2011, co-author with Fadi Daou ; in Arabic and French, 2012) ; What About the Other ? A Question for Intercultural Education in the 21st Century (editor, 2012) ; and the UNESCO publication, Christianity & Islam in the Context of Contemporary Culture (2009, co-editor with Dimitri Spivak). Dr. Tabbara has also participated in numerous research projects and organizations including the following : research coordinator, L’Arche and Islam (Adyan & L’Arche Internationale) ; member, International Federation of Catholic Universities research group on religions and cultures, focusing on the topic, “Conflicts Related to Religious and Cultural Diversity” ; researcher, UNESCO Lebanese-Russian project on youth and intercultural and interreligious dialogue. Cette thèse étudie 15 différents commentaires coraniques, dont neuf commentaires soufis, de la sourate 18 intitulée la Caverne. Elle explore les différences entre ces les commentaires soufis et non-soufis, notamment dans l’interprétation des récits. Elle déduit enfin des commentaires soufis des récits de la sourate 18 les grandes lignes du cheminement spirituel, de la connaissance spirituelle et de la sainteté. La thèse offre aussi en annexe des traductions intégrales de sept commentaires soufis de la sourate. This thesis studies 15 different Qur’anic commentaries, of which 9 sufi commentaries, of the surat al Kahf (18th chapter of the Qur’an). It explores the differences between these commentaries, focusing mainly on the difference in the treatment of Qur’anic narratives between exoteric and esoteric interpretations. It finally infers from the esoteric commentaries the guidelines of spiritual wayfaring, of spiritual knowledge and of sainthood. 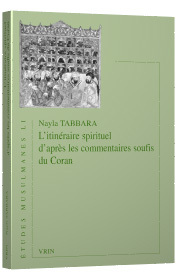 The thesis also offers translations of seven sufi commentaries of the surah.